This rips the produce’s cell membranes open and releases the juice, nutrients, and enzymes. It also breaks down its phytochemicals to create a juice richer in nutrients and minerals. Click this link for the Merriam-Webster definition of triturating. Are you serious about juicing? Then, for you, the Super Angel PREMIUM DELUXE Model 7500 Twin Gear Juicer is a must to consider. The Super Angel brand is highly regarded in the juicing community and the Model 7500 is an upgraded model. Its slow speed and twin gear design extract the maximum amount of juice, nutrients, and minerals possible without adding heat or oxidation. As you know, heat and oxidation are the two factors that reduce the health benefits and shelf life of extracted juice. Improved and upgraded, replacing model AJ5500. Motor, gearbox, cooling systems, safety sensors and control panels all upgraded and reinforced to comply with U.S. Electrical specifications. Self-adjusting speed control acts to prevent jamming. Automatic reverse functions on jamming. An automatic cooling system prevents overheating. Newly designed main control board. 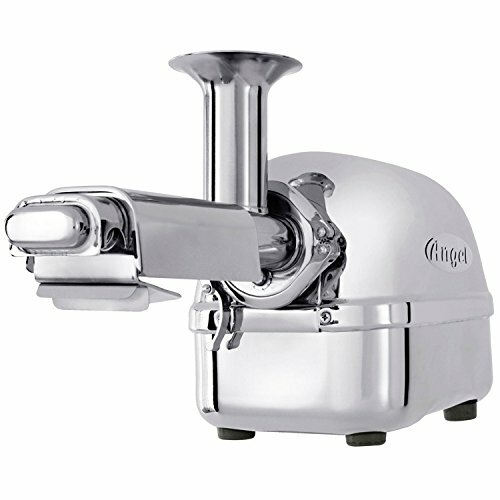 The Super Angel Juicer features surgical-grade stainless steel twin gears and extracting screen. Slow 82 rpm speed to get the most juice, 20 to 30 percent more than competing juicers, with maximum nutrient from fruit and vegetable feed. Weighing 20 pounds, the unit is light enough to move in and out of kitchen cabinets but is also perfect for countertops. Includes premium brush and glass Pyrex juice collection jar. 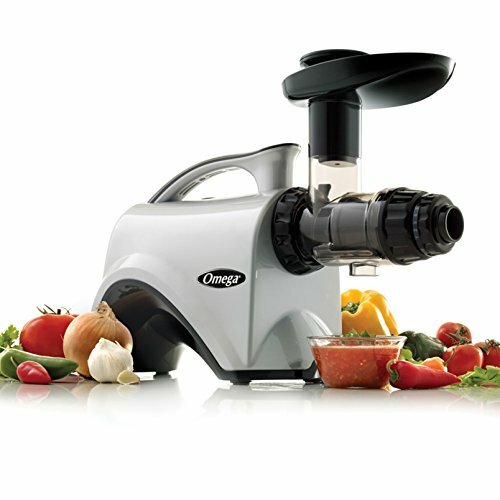 The Omega TWN30S Twin Gear Juicer is equipped with stainless steel twin gears and a knob to vary the pressure for either soft or hard vegetables or fruits. It comes with an extra juicing screen for adjusting the pulp levels. Oxidation and loss of nutrients are prevented by slow speed and the twin gear grinding action. Note: The Omega TWN30S has been discontinued by Omega. Clicking the Amazon link above will now take you to the updated Omega model NC800HDS with comparable features and specifications. Outlet adjusting knob with spring tension creates pressure to squeeze out all the juice from the pulp. Great for juicing fruits, vegetables, wheatgrass, herbs, nuts for nut milks and more. The Tribest GS-P502 Green Star Pro Jumbo Twin Gear Juicer juices a wide variety of fruits and vegetables. Hard produce like carrots and apple as well as tricky ones like wheatgrass and pine needles can all be juiced without having to stop and change any parts. It is also ready to make other delicious foods, like baby foods, breadsticks, nut butter, pâtés, frozen fruit sorbets, and more. 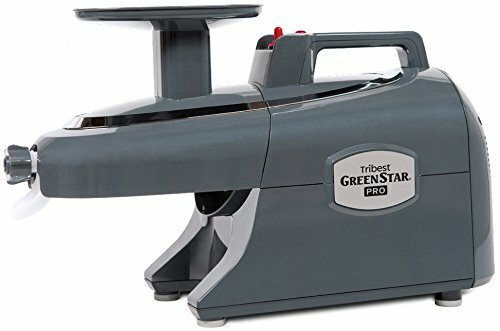 The Tribest GS-P502 Green Star Pro Jumbo Twin Gear Juicer releases all the nutritional value of the produce without adding any heat or oxidation. This makes it ideal for those wanting the healthiest juices. All stainless steel twin gears for added durability. Fewer parts for easy cleanup. Higher yields that also maximize the nutritional value of the juice. Warranty – 3 years for commercial use, 15 years for household use. Processes a wider variety of fruits and vegetables – from carrots and apples to wheat grass and pine needles, without having to stop and change parts. Make other delicious foods, such as baby foods, breadsticks, nut butter, pâtés, frozen fruit sorbets, and more. If you found this article interesting, please like it and share with your friends on your favorite social media by clicking the appropriate icon. And to see more articles like this as well as detailed reviews and updates, subscribe to be notified when they are published. You will not be bombarded by emails and your personal email address will not be shared with anyone.